This 7.62mm rifle will ‘automatically’ sight and shoot accurately out to 900 yards. No skill required. We have written before about the problems we have protecting our retreats – see for example ‘How Many Acres Do You Need for Your Retreat – Defense Considerations‘ and our broader category of Retreat Defense in general. A new development, announced at the Consumer Electronic Show in January this year, adds a new factor and concern to the mix. Until now, it has been realistic to assume that in most cases, a ‘reasonable distance’ kept clear between your retreat and where attackers could shelter was sufficient as to give you reasonable protection. We’ve always been a bit vague about how much that distance should be, because in truth, there’s no single magic answer and instead, it is more a case of having to make a compromise between what is practical and possible in the real world and what would be desirable in a perfect world. We sort of suggested that you should try to achieve a 200 yard clear zone between where your retreat and farmed land would be and where attackers could shelter and attack you from. That type of range would give you a little warning – note the emphasis on little – if attackers attempted to overrun your retreat, and you could buy yourself a bit more time by having some disruptive landscaping to prevent attackers from coming directly to you on a good surface well suited for vehicles, horses, or even just plain sprinting on foot. But the really big problem is long-range sniping. In skilled hands, even a .22LR rifle might remain reasonably accurate and definitely dangerous at 200 yards, and in a Level 2/3 situation, what should be simple survivable wounds become much more life-threatening than they do today when the local Emergency Room and state of the art medicine and antibiotics and painkillers is probably no more than 15 – 30 minutes drive away. Being able to accurately get rounds on man-sized targets at ranges of 200+ yards starts to become a fairly demanding skill. Hitting – well, let’s be polite and talk about, perhaps, 8″ or 12″ plates, at 100 yards is something that most adult shooters can readily master, particularly when firing from a supported/prone position. But once ranges start to go the high side of 200 yards, you’re more into ‘precision shooting’ than regular shooting, and from our perspective as potential targets, our chances of suffering a first round hit/kill start to measurably decline. Unfortunately, a new device looks to replace skill with technology, and promises (threatens!) to give even unskilled shooters an almost super-human ability to get rounds on target at long-range. 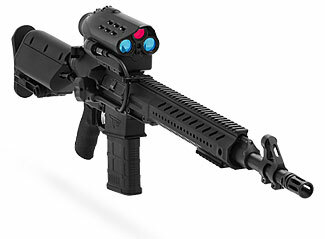 A weapons technology company, TrackingPoint, demonstrated two new sniper-type rifles at the Consumer Electronic Show. It is very rare to see weapons technology at the CES – not only because of the slightly off-topic concept, but also because just a couple of weeks after CES is the annual SHOT Show which is the typical venue for new weapons technology. But perhaps because the TrackingPoint product was more a technological solution than a weapon solution per se, they decided to release their products at CES. They offer two new weapon systems with computerized targeting and fire control. One is on a 5.56mm rifle platform, and claims to give accurate shots out to 0.3 miles (528 yards) and with the target moving at speeds of up to 10 mph. The other is on a .338 Lapua Magnum rifle platform, and claims to give accurate shots out to 1.0 miles (1760 yards) and with the target moving at speeds of up to 20 mph. To be fair, TrackingPoint define ‘effective’ differently for the two products. For the 5.56 rifle, they say it means being able to consistently hit a 5″ target, and for the .338, they refer to an 18″ target. The good news is that you’re not very likely to find yourself staring down one of their .338 caliber systems. Why? The price is $50,000 (and each round costs $8). On the other hand, the 5.56 system is a more reasonable $7,500, and for sure, this price is likely to drop as other companies start to adapt similar technology to their rifles, too. Here’s a rather terrifying review of how easy it is for a non-shooter to land rounds on target with the 5.56mm system, and here’s a review of the .338 system. If we were looking at deploying the technology as a defensive measure for our retreat, we’d probably choose their $15,000 system, based on a 7.62mm rifle. At longer ranges, we much prefer the extra stopping power of the 7.62 round compared to the light 5.56 round. Oh yes – their claim that it is good for out to half a mile (with an 8″ target as the objective) is another point in its favor, too! To come back to the actual point of this article, the ugly bottom line is that the long-range accuracy and capabilities of attackers is likely to improve over time. We’d guess that within a decade, the cost of these super-sniper-rifles will reduce almost ten-fold. Well, the $7500 5.56 system might drop to $1500 – $2500, the $15,000 7.62 system might go down to $2500 – $3500, and the .338 system might reduce to $7500 or so. Or, to put it another way, ‘intelligent’ fire-control systems will replace ‘unintelligent’ telescopic sights and cost no more than today’s best telescopic sights. There was a time when any type of telescopic sight was rare and exotic and expensive, and most people did most shooting with open iron sights. Nowadays, telescopic sights are abundant and on just about every rifle that its owner plans to use at any sort of range at all; our prediction is that the expensive rarity of these fire control systems will evolve and we’ll see them as common on rifles in ten years time as telescopic sights are today. What to do about this? We suggest two things, because in selecting and developing your retreat, you need to have an eye to the future as well as the present. It further reinforces the value/need to cluster together with other retreat owners, having a central core where you all live and farm, and then an extended safe zone outside your core – perhaps for cattle grazing, or perhaps not. And, secondly, the topography around your retreat and its perimeter becomes more relevant. If there are natural features that obscure/block your retreat or limit the longer range threats, whereas previously they might have also acted as cover for shorter range attacks, now they might be considered more desirable, particularly if you incorporate responses to such features into your defensive plan. Remote monitoring of such locations and the ability to surreptitiously and/or safely move people around your retreat become helpful considerations. 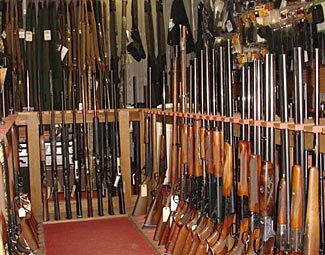 This fortunate retreat owner has a walk-in safe full of rifles, supplies, and much more. Rifles are perhaps the least glamorous of the three major categories of firearms (the other two categories being handguns and shotguns). Many people over-inflate the value of both pistols (in terms of range, accuracy and lethality) and shotguns (again in the same three categories) and many people overlook rifles, or consider them too specialized. But, in reality, if you were to have only one firearm at your retreat, it should be a rifle, which is probably the best multi/general purpose firearm of all. Another rifle might be your second weapon, and perhaps then a pistol would be your third. There are very few uses for a shotgun, which is why you don’t often see shotguns in any normal military organization. Rifles are essential for two purposes. They are of course ideal for hunting anything except birds and fish, and they are excellent self-defense weapons. The only main limitation on a rifle’s value as a self-defense weapon is your ability to carry it everywhere and deploy it quickly. This is why those people in the know refer to their pistol as the weapon they only use to fight their way to their rifle. We suggest you should have at least two rifles in your retreat. One for big game and longer range defense, and the other for smaller game and shorter range defense. The longer range rifle should probably be chambered for either the .308 or the .30-06 cartridge (these being the two most common calibers of larger sized rounds). There are a dozen or more other excellent calibers for long-range precision shooting and big game hunting, too, but we suggest you limit your choice to either the .308 or .30-06 because these two calibers are the most common, and if there is a negative situation in the future, will probably remain the easiest calibers to find and get additional supplies of. Furthermore, because these two calibers are so common, there are lots of rifles chambered for them, too. Some of the other calibers, which might have better ballistics on paper, have only one or two or three rifles chambered for them, and all of them are extremely expensive. Rifles for .308 and .30-06 can also be very esoteric, high-end and expensive too, but they can also be found for under $500. We’d suggest the rifle you choose for this purpose does not need to be semi-automatic and it does not need a high-capacity magazine. It does, however, need to be of the highest possible accuracy (ie being able to group less than 1″ at 100 yards and less than 2.5″ at 250 yards) and to have the necessary optics on it to help you get close to the theoretical accuracy offered by the rifle and the ammunition you’re feeding through it. Oh – one related point. When you’re looking at long-range ultra-accuracy, your choice of ammunition becomes almost as important as your choice of rifle. Once you’ve become comfortable with the rifle, you should then research (ie online and in reviews) and experiment with different types of ammunition until you find the one that works best for you and your rifle. This rifle is not intended for squirting off dozens of shots in rapid succession. It is intended for long-range precision, hopefully on the basis of ‘one shot one kill’. Oh yes, the ‘one kill’ part of that concept is a function not just of its accuracy and being able to deliver rounds where you wish them to go, but also of having a highly effective round that has single shot stopping power. The last thing you want is a wounded animal running off, or possibly a hostile intruder who is not taken out of the fight with the first round you send his way. Because this rifle is all about precise aimed fire, we see no need for a 20 round magazine or anything like that, and neither do we feel the need for a semi-auto action. If anything, quite the opposite. A semi-auto is always more complex than a bolt-action type rifle, with more to potentially go wrong, and more to clean and maintain. In terms of an ideal rifle for this purpose, maybe you couldn’t do better than a Remington 700, the civilian version of the popular Army and Marine (and Police) sniper rifle. The Remington 700 was first released in 1962 – over 50 years ago – and has become the best-selling bolt-action rifle of all time. More than 5 million have been sold, in an astonishing variety of 40 different calibers. They typically have a four round capacity in their magazine plus potentially one extra round chambered. If five rounds isn’t enough to bag a deer or improve a tactical situation, then probably your problem isn’t so much the rifle as it is the shooter. We’d choose the best bolt-action rifle we could afford, and with at least a 22″ barrel, 24″ being better, and possibly 26″ being better still (if not now becoming too heavy to carry reasonable distances). You’ll note we’re carefully not talking in detail about the ideal caliber for this rifle. We like .308 due to its ubiquity (and that’s our primary caliber we use ourselves for this type of purpose), but we also accept that beyond about 250 – 300 yards, it is not as good a choice as some other calibers – see for example, this webpage. On the other hand, as this webpage points out, while there might be better calibers for longer range work, the .308 can still ‘get the job done’ out to maybe even 800 yards, in good conditions. If circumstances allow, maybe you might add a third rifle to your collection as well for ultra-long range and ‘specialty’ work. See our suggested third rifle choice, below. Maybe it is acceptable to have the .308 for ranges from about 100 – 400 yards, and a different rifle for ranges further out than that. If your target is within 100 yards, you might want to consider a rifle that can deliver rounds more rapidly – especially if it is the type of target that can shoot back. A person can sprint 100 yards in 10 seconds – you’re at the point where ‘quantity of fire’ starts to become as important to you than ‘quality of fire’. You’ll have an idea for the maximum ranges you are likely to need based on the topography of your area. Thick bush and uneven ground of course mean you won’t have the visibility and unobstructed opportunities for longer range work; open prairies mean that longer range considerations become more relevant. If you’re seeking smaller game, or if you’re anticipating a closer range problem with attacking marauders, your requirements change and the first rifle is possibly no longer your best choice. You no longer need perfect accuracy, and you probably want a rifle that is lighter, easier to carry and deploy (this also implies a shorter barrel) and the ability to sustain a higher rate of fire. On the other hand, it is easy to get carried away with these considerations. Maybe you’re imagining yourself having to single-handedly fight off a zombie horde of hundreds of attackers – if this is the scenario you are planning for, then you just need a pistol and one round. You’re going to lose, and you may as well save everyone a bunch of trouble and simply shoot yourself! Look for example at the main battle rifles that the US has deployed up to the Vietnam War (and consider also how disliked the M-16 and its derivatives have been ever since their introduction). Until the Vietnam war, most troops were equipped with bolt-action heavy caliber rifles or relatively low capacity semi-auto and equally heavy caliber rifles. The solution to whatever your need is under this category is not only to increase your ability to shoot more rounds downrange in less time. Aimed and effective fire still remains a high priority. However, having said that, we recommend you should have a semi-auto AR-15 type rifle chambered in 5.56mm, and with 20 or 30 round magazines, and a bayonet if at all possible too. There are other potential calibers and rifle designs too – most notably the AK47/SKS family of weapons chambered in 7.62×39. These are fine weapons, and can perform reliably in adverse conditions. We don’t dislike them, but we opted for the AR-15 family due primarily to what we anticipate may potentially be a more readily available ongoing supply of ammunition for the AR-15. You will also find ‘carbines’ – a concept which we’ll define as relating to fairly short-barreled rifles that fire pistol rounds. The good news is you only need to carry one caliber of ammo, and you can feed both your rifle and your pistol with the same ammo. The bad news is that you’ve almost certainly ended up with a massively underpowered cartridge for your rifle, and we feel that’s too much sacrifice for the small improvement in reliability. One possible exception to this would be the 5.7x28mm cartridge, but this is an ‘exotic’ and rare cartridge and there’s really only one manufacturer of pistols and rifles for this cartridge. We like the FN firearms chambered for this amazing cartridge, but we’d never base our retreat on this rare cartridge, and (based on personal experience) we’re unconvinced how robust the firearms are that feed it. In terms of barrel length, then our first choice is around 18″ of barrel. Below that and the muzzle blast starts to increase perceptibly, above that and the weapon starts to become less portable and more unwieldy. But we know people who prefer longer barrels, and others who prefer shorter ones. This isn’t an essential parameter. This is a weapon you’d typically use for ranges from zero to perhaps 200 yards. Sure, it remains accurate further out, but it starts to lose appreciable energy and ‘one shot stop’ effectiveness, and when you are considering targets more than 200 yards away, many times you can enjoy the luxury of careful slow aimed fire rather than needing the ability of a semi-auto AR-15 type rifle to shoot many rounds quickly. The main benefits of an AR-15 style rifle are that it is light, the ammunition is also small and light, and you can shoot many rounds quickly. It is a great ‘take anywhere/everywhere’ rifle. That is not to say that they are not also potentially very accurate, particularly at relatively short ranges (ie under 200 yards). Good sights for such rifles would have low rather than high magnification, and a wide-angle of view making it easy for quick target identification and acquisition. Many different companies make AR-15 clones, and most of them are good. There are two basic design styles – those that use gas blowback to cycle the action, and those that use a piston to cycle the action. The piston operated rifles tend to be ‘cleaner’ and slightly more reliable, but are also slightly more expensive. Barrels are available either with a chrome lining or not. Chrome lined barrels are probably not quite as accurate, but are more resistant to heat. Regular steel barrels are more accurate, but will wear out more quickly, particularly when they get hot. We’ve seen some incredible claims for barrel life, but realistically we suggest you try and limit yourself to under 20 rounds a minute if firing for an extended period of time. And maybe keep an extra barrel or two in your spares. If you anticipate confronting threats at long ranges, or threats that are well protected, then for sure your AR-15 becomes useless, and the value of your .308 starts to diminish as well. For the rare occasions when you need to ‘reach out and touch someone’ who is half a mile away and wearing body armor, or when you need to disable an armored vehicle charging towards you, it is time to turn to a very specialized type of rifle – probably something chambered for either .50 BMG or .338 Lapua rounds. No reasonably common and modern rifle legal for civilian ownership can deliver more energy a longer distance than a .50 cal. There are some esoteric cartridges out there, and larger diameter cartridges (such as a 0.700 cartridge that costs $100 a round, but which delivers less power than the 0.50 cartridge!) but none of them are as useful or effective or appropriate as the 0.50 BMG. Note that a rifle chambered for 0.50 cal rounds is not a portable rifle to take with you hunting. It is a huge and heavy rifle (perhaps weighing 30 lbs) that is not really ‘man portable’ – it is okay if you are traveling in a vehicle, and perfectly fine to deploy in/around your retreat, but it is not a field weapon that you’d carry with you ‘on maneuvers’. A rifle in either .50 or .338 will give you a solution capable of accurate fire out to almost a mile. Our preference is slightly weighted in favor of the .50 BMG chambering – the ammunition is slightly more common, and while the extra range is not significant, the extra power (in terms of ft lbs of force) is enormous. There is also a .416 Barrett caliber, and that is good too, but .50 remains the most common and usually least expensive. It is also by far the most powerful. This is a weapon you’d only deploy against armored targets and ordinary targets outside the effective range of your .308; ie, perhaps from about 300 yards and further out. A Barrett is the classic .50 cal rifle, but there are others that are nearly as good. All are, of course, very expensive. But they are worth it. In 2001, a Barrett M99 set a world record when it shot a 4.09″ group at 1,000 yards. 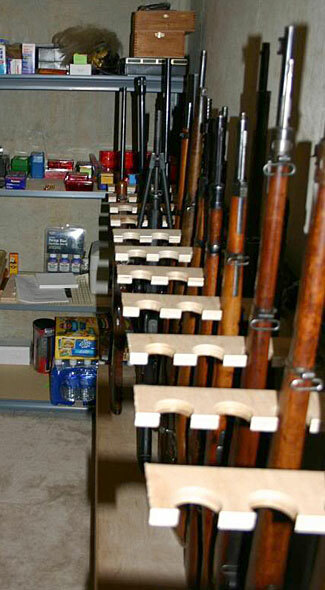 If you feel the need for additional rifles to fill up your gun safe, what else should you get? Perhaps the most notable omission from our two or three rifle list, above, is a .22 cal rifle. But we’re not sure what you’d ever use it for, apart from fun/plinking. It might have some use as a training rifle to introduce youngsters to the principles of proper techniques and marksmanship, but that would be all. We like .22 rifles. They’re a great deal of fun, can be very straight shooters, and are great for small game. In skilled hands, a well placed .22 round can be surprising effective, even on bigger game and for self defense. But, please note the two things we emphasized in the previous sentence. While a .22 is easy to shoot, it needs to be shot very well in order to get the critical placement of rounds on target that is necessary to ensure effective results. A .22 delivers about 120 ft lbf of energy when leaving the muzzle. That is not very much. Compare this to even a 9mm pistol round, with over three times the energy, or a .223 round with more than ten times the energy or a .308 with twenty times the energy. Our point is simple. Unless you’re a great shot, and with easy targets, a .22 might not be a good choice. Getting more rifles beyond the three listed above (and maybe a .22) should be done while keeping two things in mind. Unfortunately, the two concepts are opposites, but you need to balance them out. The first concept is keeping as much the same as possible. You don’t want to end up with a terrible mess of different rifles and different calibers. Each different rifle has a slightly different ‘manual of arms’, with slightly different quirks and techniques and requirements for mastery and maintenance. It is much better to have two rifles the same, so you only need to learn one set of skills, and only need to keep one set of spares, than it is to have two different rifles. You also don’t want to have too many different calibers of ammo. It is much easier to keep an adequate supply of only one or two calibers than it is to have enough rounds for each and every different caliber. So, if it were us, and using these concepts, each extra rifle we buy would be identical to the first two rifles we already have – more AR-15 clones (ideally from the same manufacturer because not all parts are totally interchangeable between manufacturers) and more .308 bolt-action rifles. We might eventually buy a second .50 Barrett, but that would mainly be as a spare; we can’t think of any likely scenarios where we’d ever need more than two. The second concept is, as we said, the opposite of the first. If you are getting some more rifles, why not get them chambered in other common calibers that you don’t already have? The ‘logic’ of this is to anticipate that possibly in the future you might come across an opportunity to acquire some ammo in a caliber for which you have no firearms. It is reasonable to assume, in an extended Level 2 or 3 situation, that ammunition will become extremely scarce, and you’ll want to get any you can obtain, so maybe it makes sense then to keep some inexpensive additional rifles in some ‘just in case’ additional calibers. We’d probably choose to add an inexpensive AK-47/SKS rifle so we had something that could shoot 7.62x39mm cartridges, and some sort of bolt or lever action .30-06 in case we came across some of that ammunition too. These are two other very common rifle calibers. How Many Rifles Do You Need? Well, we opened this article suggesting you have one or two rifles at your retreat, and somehow we’ve talked ourselves (and possibly you too) now up to six, seven, eight or more. Many people will be rolling their eyes at the thought of any one person owning seven or eight rifles. But there’s a logic trap in that thought – your retreat is probably not just for one person. Your retreat – and therefore your rifles – will be for you, your family, and maybe some additional friends and relations, too. Beyond that, it is conceivable that you might even accept in some additional people WTSHTF, growing the total community even more. You should plan on having at least one rifle per adult member of your retreat community. It is true that in an all-out defensive situation, you probably would not have every adult ‘manning the ramparts’ and actively defending your retreat, because you’d have some people doing duty coordinating and controlling, bringing ammo, tending for wounded, and so on, but as a rule of thumb, it makes great sense to have at least one rifle per adult. We’d suggest one AR-15 per adult, plus another one AR-15 for every ten or part thereof AR-15s you have (for spares/emergency replacement), because these are most likely the rifles you’d use for close-in self-defense. In addition to that, you should have at least one .50 cal rifle, and a certain number of .308 rifles too. Maybe one .308 for every two or three people in your community, with a minimum of two, and always at least one more than this formula suggests. Then add two or more each of some type of .30-06 and AK/SKS rifle for ‘just in case’ purposes, and possibly a .22 trainer. There are no federal restrictions on how many rifles you can own, and apart from completing a form when you buy a rifle from a dealer so they can do a background check on you, no federal licenses or registration is required. There are some federal regulations relating to fully automatic rifles and very short-barreled rifles, but assuming you buy ‘normal’ and ordinary rifles from dealers, you’ll not run afoul of such requirements. Each state may also have state level legislation about rifles, and, to make things even more complicated, there could possibly be city or county issues too. Your gun dealer can tell you about these. Some states have limitations on rifle magazine capacities, some states have limits on what calibers can be used for various types of game hunting (and plenty of other rules and regulations on hunting wildlife too! 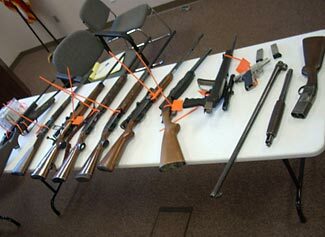 ), and others have restrictions on ‘assault rifles’ – that is, rifles that look nasty and scary. Most states have few or no restrictions on ammo purchases, and there are no federal restrictions on ‘normal’ ammo purchases (explosive rounds, armor-piercing rounds, and other specialty rounds and some shot-shell ammo can be the exception). It is possible that there might be local fire code or other restrictions on how much ammunition you can store. Something to be careful about is if you are sharing your retreat with someone who is not allowed access to firearms. Simply being in the same house as firearms can constitute an offense, with either or both of you possibly being liable to charges if such a thing occurs, and possibly also resulting in the impounding of the weapons. Rifles are somewhat stressed mechanical devices. They have moving parts, and are subjected to great pressures and temperatures. This means – and please don’t be surprised – they wear out and sometimes have failures. You need to have a supply of spare parts so you can maintain your rifles. Even the most expensive of rifles can be made totally useless by the failure of a 50c spring. Make sure you have plenty of all conceivable spares – a non-scientific approach is to simply buy one extra rifle per every so many working rifles and cannibalize the extra rifles for spare parts as needed. The problem with this approach is that some parts will probably never fail, whereas other parts will fail more than once. So buying a spare second rifle, while guaranteeing you have a complete set of spare parts for your main rifle, is an easy way of getting a complete set, is not the best way to get maximum life out of your rifle. Get friendly with a local gunsmith, read up on the various firearms forums, and do as much research as you can to work out which parts you need to have two or three of, and which parts you don’t need spares for at all. The good news is that many of the parts you might foreseeably need to replace are inexpensive. Now for a related thought. Have you ever been in a car that experiences a flat tire, only to find that the tire wrench is missing? How frustrating is that! The chances are you’ll need some special tools to do more than quickly ‘field strip’ your rifle. Make sure you have a complete set of gunsmithing tools so you can work on each and every one of your firearms. Now for another flat tire analogy. Have you ever driven by a car with a flat tire, and seen the driver (dare we say, possibly a woman) sitting helplessly in the car waiting for someone to come change the tire for her? Our point here is that it isn’t enough to just have the spare parts and the tools. You also need to have some knowledge and training. To be realistic, of course you can’t be expected to become a fully qualified and skilled armorer, able to do anything to any firearm. But what you can do is get manuals and guides for how to maintain your firearms, and possibly videos as well. The good news is that firearms are basically quite simple and very logical in how they operate, and the better the firearm, the simpler it is. But even the best simplicity still has some tricks and traps wrapped up in it, particularly when it comes to things like what order you disassemble and reassemble parts, and how to align pieces together so they fit back together readily, and so on. So – spare parts, tools, and gunsmithing/maintenance manuals. Get it all. How much ammunition do you need? How long is a piece of string? There’s no such thing as ‘too much’ ammo (unless you’re a gun-hating journalist writing a story for a left-wing pro-gun-control media outlet, in which even a couple of boxes of ammo gets described as a ‘hoard’ or ‘massive stockpile’ or ‘arsenal’). 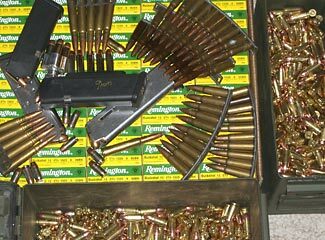 Ammunition has a very long storage life (think in terms of decades) and is likely to hold its value or even appreciate. Particularly in a Level 2 or 3 future, we think that ammunition will become an extremely valuable currency. But be careful who you trade it with – you don’t want it coming back to you, lead first! We’d suggest you invest in some thousands of rounds of ammunition for each caliber you have firearms for. We know people with tens of thousands of rounds of ammunition, and none of them have yet regretted it. If they ever did, they could sell their ammo for more than they paid for it. We suggest you don’t give any thought to acquiring silencers for your rifles. While they will slightly reduce the sound level of each shot you fire, they won’t make your rifle totally silent by any means and it will probably still be clearly heard for some hundreds of yards. You’ll still scare off game if you don’t make the first shot, and you’ll still draw attention to yourself from other people in the vicinity. If you do buy a silencer, you definitely get your name red-flagged on any federal lists of firearm holders (you know, the things we’re told they don’t keep!). Silencers (and the federal taxes on them) are very expensive, they add to the bulk/length of the rifle, and don’t do what their name implies they might. Leave them well alone. Whether you plan only to use rifles for hunting, or whether you are concerned about repelling hordes of zombie invaders, you need to have some rifles in your retreat. Go look in your kitchen. How many cutting knives do you have? Probably half a dozen, maybe more. So why shouldn’t you have multiple rifles, too – each one optimized for some specific purposes, just the same as your kitchen knives.